Magellan’s newsletter has information for high school students and their families about the college application process and financial aid. 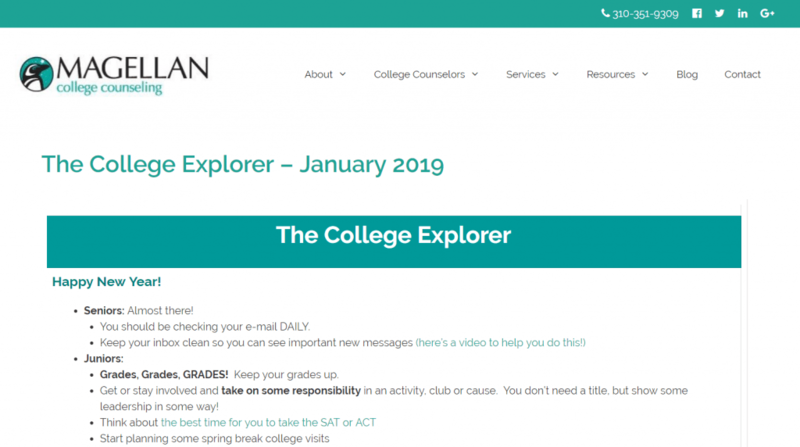 We publish our Magellan College Counseling Newsletter around once a month, to keep you up to date and make sure you know the latest college admissions news, whether your child is in the 9th, 10th or 11th grade, or already a high school senior. In every issue, you’ll learn something new, and hopefully, helpful! You’ll find out about the latest updates in admission for both California colleges and colleges outside of California. We’ll even let you know what deadlines and college admissions events are coming up, and what you need to do about it. If you’ve got a college bound child in high school, you can sign up here if you’d like to receive the next issue by e-mail. You can also click the links below to read our college counseling newsletter archives. Do you like our college counseling newsletter? Then you’ll like our college counseling services even more! And here’s just one tip that we share with all of the parents we meet: Preparing for college in your senior year is LATE. Your child’s peers are starting now, or have already started. They’ll be competing with thousands of other students to get into the same great schools. The earlier you begin preparing for college, the more choices your son or daughter will have. Call us (1-877-5-MAGGIE (877-562-4443)) or contact us for a consultation. We’d love to meet you and help any way we can.